Instabug allows your mobile users and beta testers to report bugs and send feedback about your mobile app directly from their devices. Instabug captures a screenshot that users can draw on and captures all device details in the background. Integrating Instabug with Asana gives your team in Asana all the details they need with each task to fully understand it without the need to go back to your users and ask for more info. 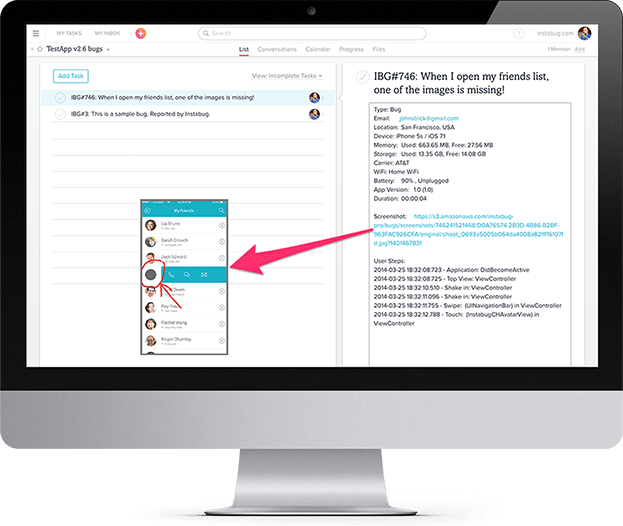 With this integration, your bugs and users’ feedback can be converted to Asana tasks with just a click! Download and integrate the iOS or Android SDK. Open App Settings -> 3rd Party Integrations -> Add new -> Choose Asana and enter your details. Activate your plan and use the promo code: InstabugLovesAsana for 50% off your first month. Learn more about Instabug and Asana. Check out a video of Instabug in action.